I know, you all probably thought I fell off the face of the earth. I am still alive, life has just been busy busy busy. I’m guessing most of you know what I’m talking about! Two of my boys are playing baseball, on different teams. I’m new to this whole baseball mom thing, I didn’t realize there were as many games in Little League as in real Major League Baseball. Let this be a warning to you. So for those of us who do have an insanely busy life (isn’t that everyone?) 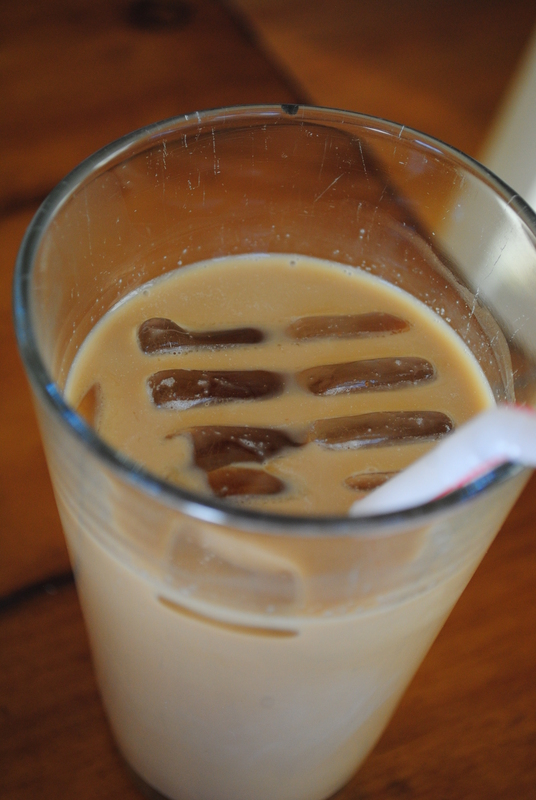 here is a fabulous iced coffee “recipe” for you. I hesitated to even post it because it’s really not a recipe. 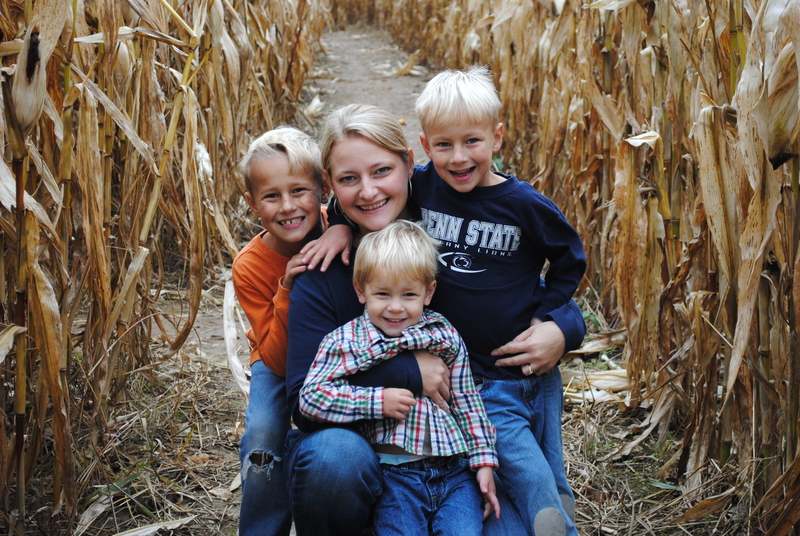 However, everyone I’ve shared it with has loved it, so I wanted to pass on the love to others! My brilliant friend Anne actually came up with this recipe and has graciously allowed me to pass it on. I am grateful to her every day when I drink this! Thank you dear Anne! This is so easy and I’m addicted to it, plus I like knowing what’s in it and being able to control the ingredients. On that note…Mr. Chaos and I (and a couple friends) are on a diet. This is my first diet ever and I was very scared. But I have to tell you, it isn’t too bad. I think the first week was the worst. We are using the My Fitness Pal app. It really is quite cool! I lost 2 pounds the first week 🙂 That is very motivating! Of course, it’s extremely hard for my baking self NOT to be baking. I’m dying to bake, but that really defeats the point of being on a diet. 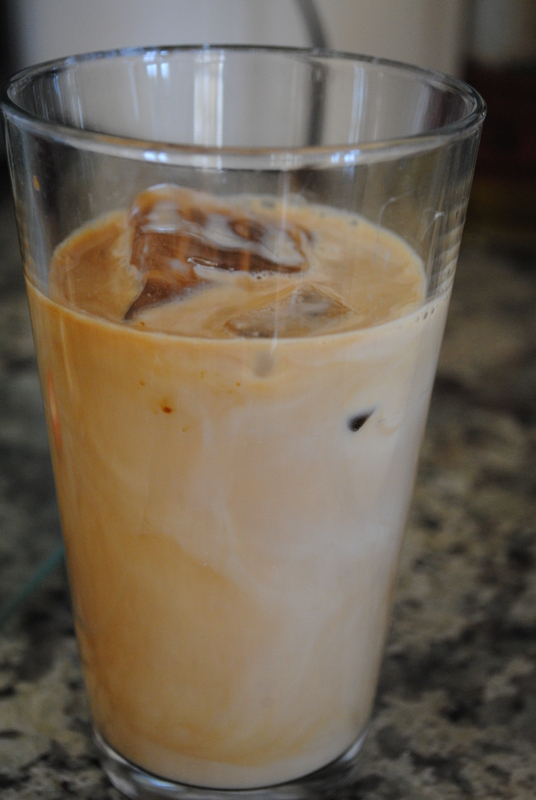 However, I have managed to include an iced coffee most days of the week and that is a nice treat. I make myself a version that is 110 calories. I was pretty proud of myself for getting what I want with that amount of calories. Also, I make my coffee with raw, whole milk, so if you use another type of milk it’s likely your coffee will be less calories or you can drink a larger size ;). Update: I’ve also come up with a 65 calorie version, it’s listed below the other recipes. 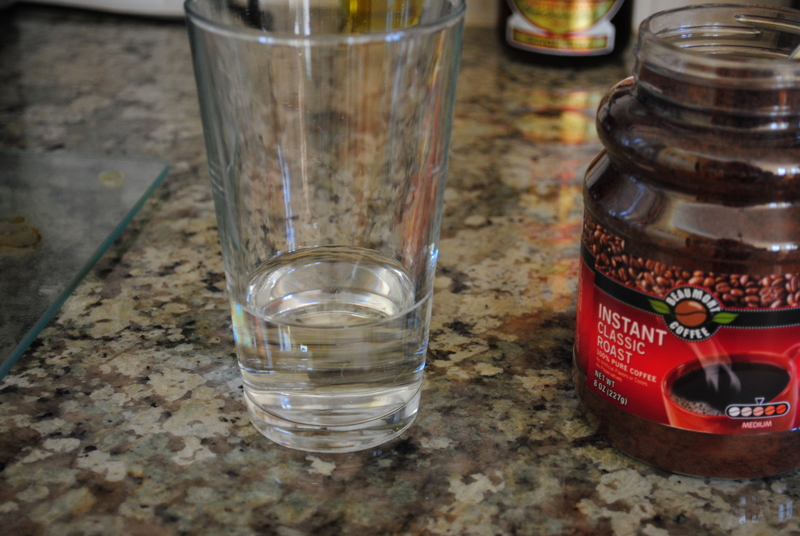 Grab a regular size glass and fill it about a 1/4 of the way with slightly warm water. 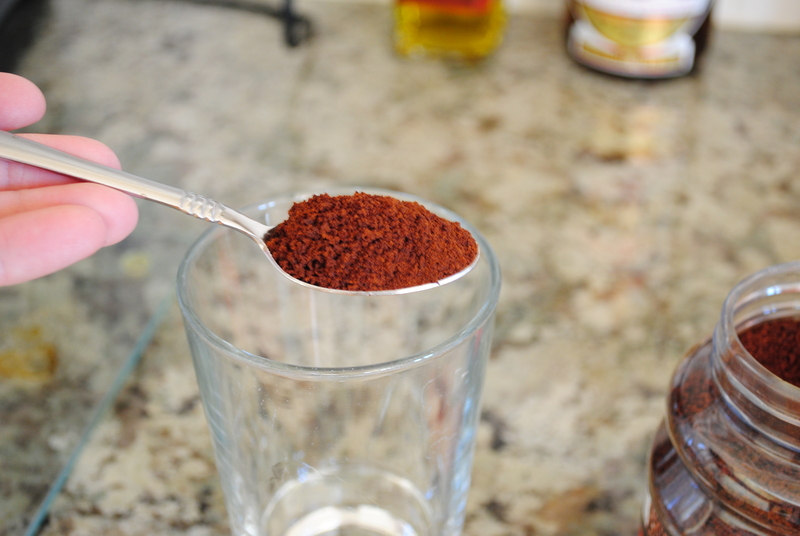 Next take a scoop of instant coffee and dump it into the water. 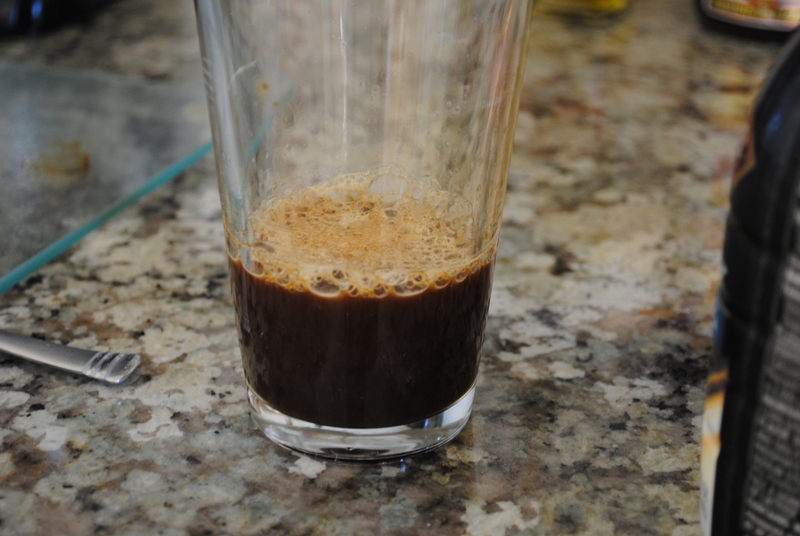 Give it a stir until the coffee is dissolved. 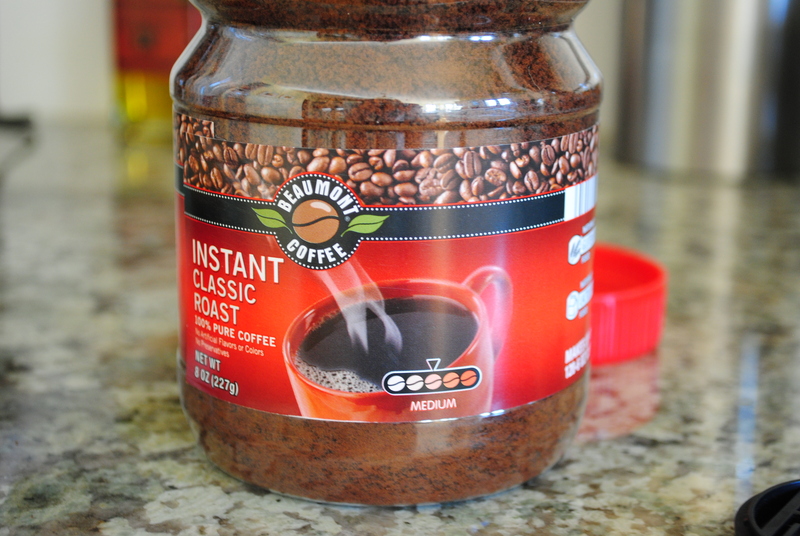 Any kind of instant coffee seems to work. This is Aldi’s brand. 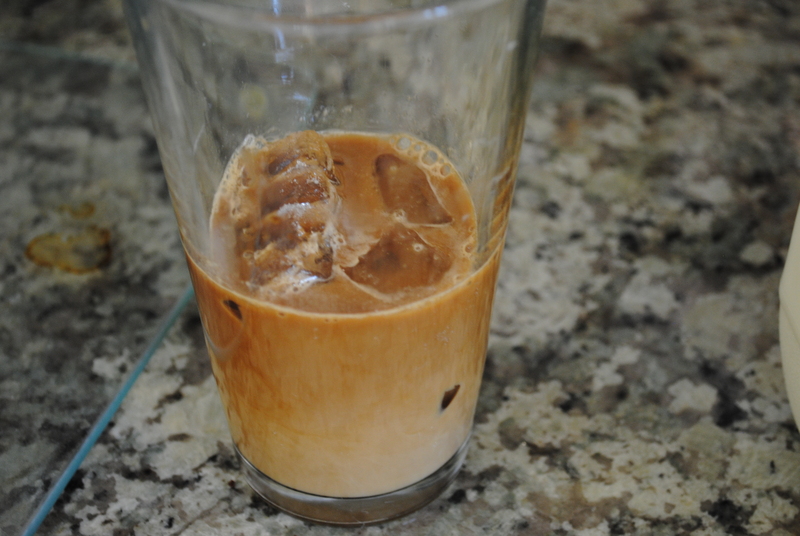 I have to admit, I was a bit skeptical when I heard this started with instant coffee, but I was soon a believer! 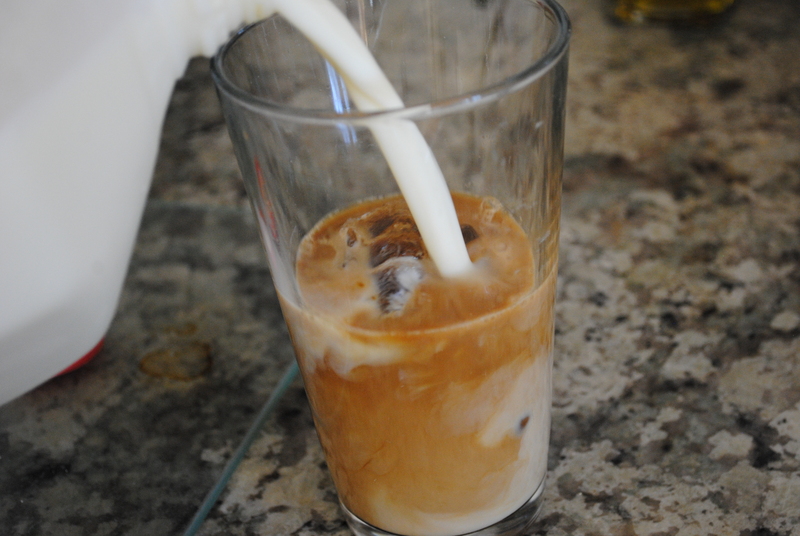 Next take your favorite liquid creamer and pour a generous splash into the coffee. I always stand and drool as the cream pours luxuriously into the black coffee. I prefer a flavored cream, but whatever you like is fine. I love all the newer “real” creamers that have come on the market in the past couple years. I love the trend in going toward a little bit more real food (or cream). I avoid fat free foods, so I appreciate these creamers. 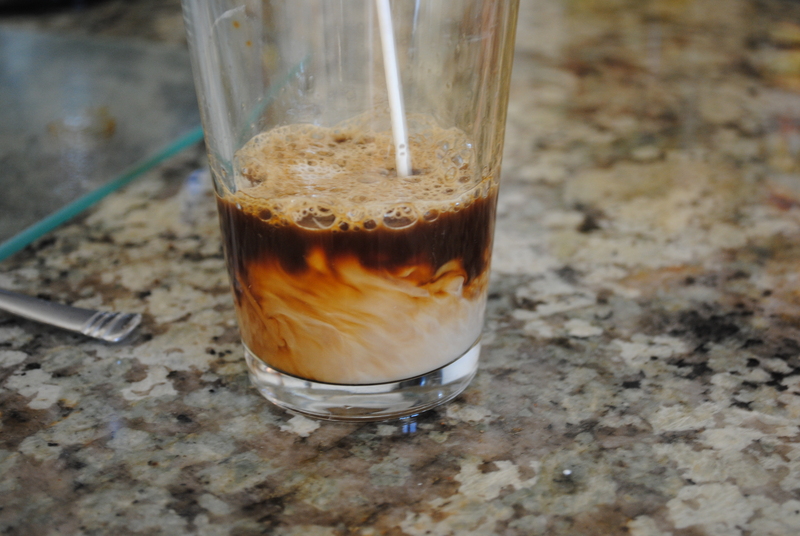 Give it a stir and then drop in a couple ice cubes. Then fill most of the rest of the way with milk. That’s it! I love that I can make this in 30 seconds. Grab a straw and enjoy! Of course if you want to go all out, add some whipped cream on top! I hope this drink makes your summer a happy time 🙂 It definitely makes me happy! I just made this and it’s great! 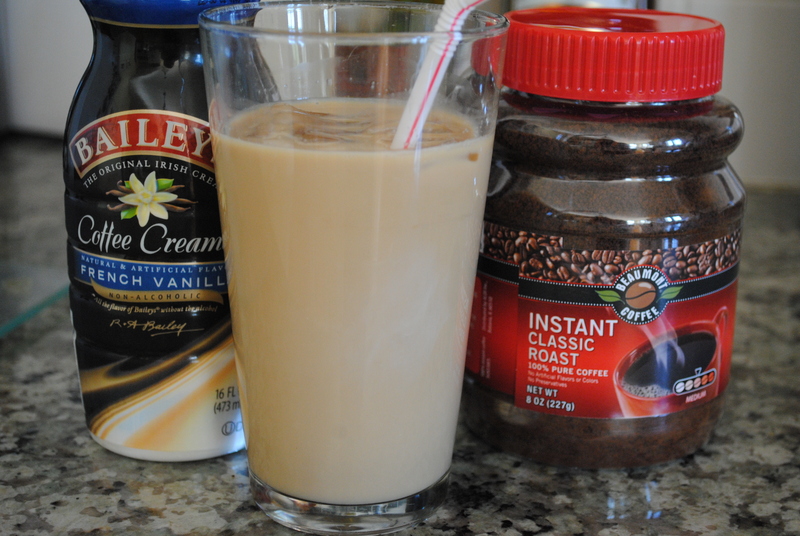 I used one packet of Taster’s Choice instant coffee and one big squirt of Java Delight liquid coffee flavoring (French Vanilla) and followed the recipe.